The pads on our dog’s paws are vulnerable to the effects of ice and snow, so it’s crucial that we take every precaution possible to keep them well-protected on those long winter walks. One especially helpful thing you can do is rub some easy DIY paw wax onto his pads before letting your doggy step outside. (Helpful hint: Paw wax is also great protection against gravel and other abrasive surfaces, and can help give your dog some grip to stop him from sliding all over the wood floors in your home!). 1. Melt the beeswax. You can purchase commercial grade beeswax and follow the instructions on the package on how to melt it. You can typically find beeswax at local craft stores because it is an ingredient for making homemade lip balms. Approximately one ounce of beeswax is a good starting point for a batch of dog paw wax. 2. Add the olive oil or avocado oil to the melted beeswax, drizzling in a little bit at a time and stirring the mixture until it has the consistency of whipped cream or a whipped batter mix. 3. Add one pinch of borax to the mixture. Stir it until the borax is mixed into the oil and beeswax mixture. Store the paw wax in an airtight container to keep it fresh and soft. Keeping the air away from the paw wax mixture also prevents the mixture from discoloring. 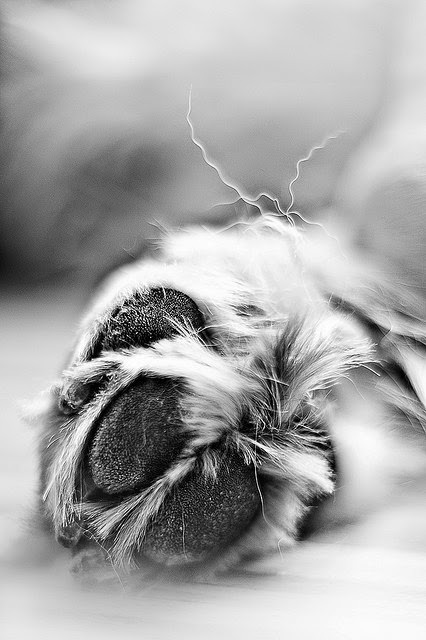 Apply the paw wax to the pads on the bottom of your dog’s paws. You only need one or two small dabs of wax for each paw. Rub the mixture onto the paw pads similar to the way you would rub moisturizing lotion onto your own feet or skin. When the wax dries, it will create a protective covering on the pads of the dog’s paws. Your dog will probably try to lick the wax you apply to its paws. While the ingredients are organic and safe, try not to let your dog lick off the wax, because it will lick off the protective element you have applied. If your dog has open wounds on the pads of its paws, you should treat the wounds and allow them to heal prior to applying the protective wax. Contact your veterinarian for appropriate treatments for open wounds or sores on your dog’s paw pads.